Scenario planning is a business analysis tool which helps determine if a scenario is plausible. Indicators are identified to help determine the likelihood of specific events occurring. A scenario analysis requires a focal question that describes our scenario. For the purpose of this analysis and in the context of the research question, the focal question is: What are the benefits of OD? It is likely that OD will support innovation and research but it is difficult to measure. The mere process of releasing OD will in turn help leverage public sector information; private sectors and governments will benefit from the release of OD. The two most uncertain and important excerpts remain the support of innovation and research. This is aligned with the survey result where 96% of participants agreed that innovation was very important for Canada. 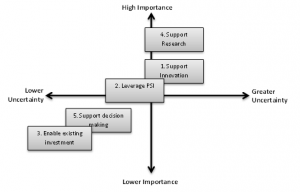 In addition, there are still uncertainties to how OD might support research and innovation. The previous diagram represents the importance and uncertainty of each presumed benefit. The previous diagram provides a graphical representation of four possible outcomes within this scenario framework. 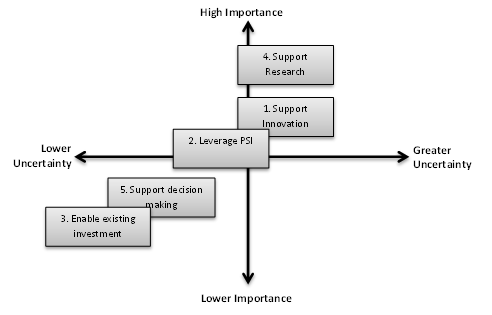 By taking the two most important but uncertain excerpts, the support of innovation and the research, we can build a plausible story narrative that will explain how the support of innovation and the research will provide benefit from the current state of affairs to a future described by each of the following quadrants. In this scenario OD informs and supports research and private sectors with valuable data and in turn helps research and development to increase Canada’s competitive ability in the world market. 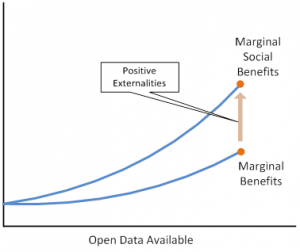 New markets for open data are created through the development of solutions and novel ideas. Collaboration is heightened and governments are viewed as transparent. Innovation provides knowledge that informs strategic directions for governments and industries. Research and development is enhanced, rapid advancements and developments are created, and research outcomes become a catalyst of growth in Canada. OD enables the creation of new markets and services. A new demand for knowledge is created which creates a need for new enterprises. The sharing of data is in high demand and new companies are created to meet the demand for new products and services. In this scenario, OD enables the creation of new markets and services. A new demand for knowledge is created which drives new enterprises. The sharing of data is in high demand and companies are created to meet the demand for new products and services. Meanwhile, OD does not support research and newfound knowledge is not obtained. If research and development efforts do not enhance the advancement of new and innovative products and services, research will not become a catalyst of growth in Canada and the economy will eventually suffer. Even if the sharing of public data heightens the economy, it will not have a long-term effect on the economy if OD does not reinforce research. The creation of new markets will be temporary if the economy is not supported by enhanced research and development. 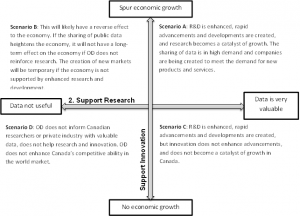 In this scenario OD informs and provides the research community and private sector with valuable data but does not help increase Canada’s competitive ability in the world market. OD does not support innovation and economic growth and new products and services are not created. The development of solutions and novel ideas do not enable the creation of new markets and services. 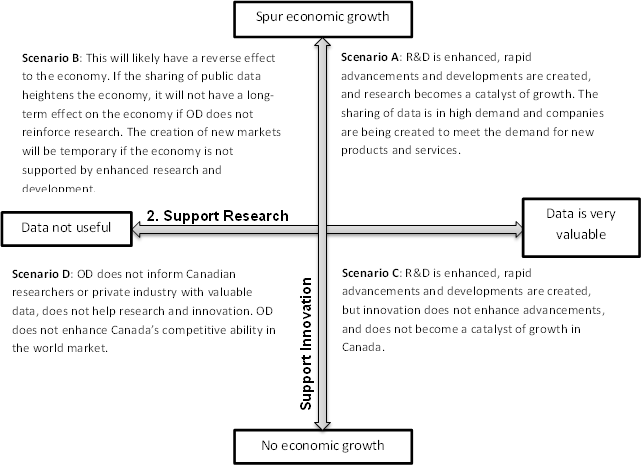 Research and development does not enhance advancements and innovation does not become a catalyst of growth in Canada. This scenario is highly unlikely given the value of shared information. In this scenario OD does not support research and private sectors with valuable data. It does not help economic growth, nor does it increase Canada’s competitive ability in the world market. New markets are not created through the development of solutions and novel ideas. Furthermore, collaboration would not improve and governments would not be viewed as transparent. Innovation does not become a catalyst of growth in Canada. The plausible outcome of this analysis is determined by the probability of a specific scenario occurring. The likelihood that OD creates and supports innovation and research is very high. We have already identified the academic community as primary users of OD and the private sector is increasingly using OD to bolster innovation. These are the users that have the skills and tools to aggregate data and create added value from their in-depth analysis of the data, which will in turn provide heighten information, knowledge and wisdom to society. The release of OD is likely to create benefits for these groups and in turn provide them with additional resources to complete other relevant tasks. Constance Gustke, “All the Options.” Conference Board Review 46, no. 1 (Jan, 2009): 18-23, https://ezproxy.royalroads.ca/login?url=http://search.ebscohost.com.ezproxy.royalroads.ca/login.aspx?direct=true&db=buh&AN=36615374. In order to identify the social, economic and environmental benefits of shared data from public organizations, an analysis of both primary and secondary research comprised mostly of quantitative information was conducted. The original intent of this research was to conduct a cost-benefit analysis, but after further assessment, the need to determine the return on investment for governments became a moot point since most organizations are mandated to share Public Sector Information (PSI). Identifying costs of publishing OD will not help identify benefits. The focus of the analysis will be to determine and categorize the various benefits that OD can provide. Similar to qualitative evaluation methods used to analyse human services programs, this research methodology will attempt to identify social benefits of public service programs. Open and accessible data can sometimes include OD published by private organizations. For the purpose of this paper, references to OD or primary data will include data accessible from public organizations while secondary data originates from external parties. 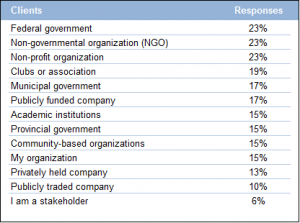 In addition, references to internal stakeholders consist of individuals from a public organization while external stakeholders refer to individuals representing academic, private, for-profit or not-for-profit organizations or associations. A survey targeted to individuals involved or working with OD was conducted to help establish economic and social benefits. Individual interviews with representatives from public organizations were conducted to identify challenges with publishing OD while interviews with external experts involved or working with OD were also conducted to help identify challenges and benefits of using OD. Furthermore, a focus group session was also conducted with external experts involved or working with OD. An initial review of academic literature was carried out, focusing on research knowledge of public organizations, shared data information practices, technology trends and changes related to public sector information. A review of secondary research was also conducted on government transparency and public sector information including open data, open access, open source, open government and trends to open and accessible information. Information gathered for this research is comprised mostly of qualitative information. This required a research method that was qualitative in nature and capable of understanding the phenomenon and the behaviors towards the OD movement. This paper uses a scenario analysis to determine the likelihood of specific events occurring. In addition, this methodology can only demonstrate the benefits linked to the data being accessible and not the quality or value of the data itself. There are limitations to the design employed in the current study because a scenario analysis attempts to determine plausible outcomes. Furthermore, sample restrictions from a limited scale of the population and few longitudinal measurements from different levels of governments can also affect the outcome. Despite its limitations, a scenario analysis was used because it analyses future events by considering possible alternatives, which determines the impact and benefits of OD. The three methods used for collecting primary data included: a survey of potential individuals involved with Open Data, a focus group session with external participants and interviews with both internal and external informants. 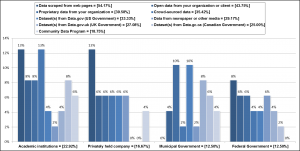 The survey and interviews included quantitative questions that focused on dollar figures and performance indicators and qualitative questions focused on opinions, viewpoints and trends. Participants completed the survey within 20 minutes; the focus group session and most interviews lasted one hour. Information was first collected and analysed with the survey. The outcomes of these analyses were then validated with the focus group session and interviews. The survey was presented in an online format using the “SurveyMonkey” platform; it included 22 questions, which are listed in Appendix 1. The survey was distributed to 42 specific groups or organizations working with OD, and invitations to participate in the survey were sent to all individuals involved with these groups. The survey was open for a period of seven weeks and 123 participants responded. The results were collected and analysed in order to inform further research. The interviews included predefined, open-ended questions that allowed for improvised responses which generated additional questions. A list of the predefined questions can be found in Appendix 2 and Appendix 4. This unstructured format was ideal for qualitative questions and allowed further discovery of individual viewpoints. Interviews were conducted face-to-face or by phone; each participant signed a consent form and hand written notes were taken. Five interviews where completed with internal stakeholders while five additional interviews were conducted with external stakeholders. The objective of the focus group session was to generate a conversation and a diverse set of options derived from specific challenges with OD. The session was conducted face-to-face and included three participants. The process consisted of exploring ideas in a divergent manner consistent with the Creative Problem Solving (CPS) model for generating novel ideas to address specific challenges. Two challenges were presented to the group in the form of a question; these questions can be found in Appendix 3. The informal setting and the divergent conversations allowed participants to share stories and engage in further discussions on the topic of OD. The topic of open and accessible government information is a profound issue for several advocacy groups, which included a wide range of external stakeholders. Using qualitative research methodology, these non-random samples of the population were not randomly selected, and in turn provided useful insight into the phenomenon of OD. Specific groups of participants were targeted for each method of collecting primary data. 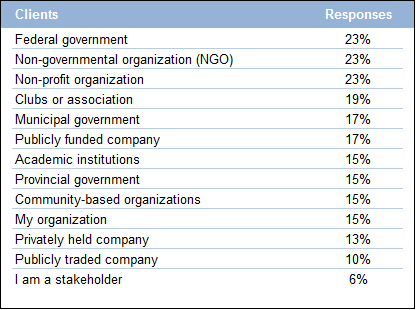 Participants for the survey consisted of individuals involved or working with OD from any country and sector including academic, public, private, for-profit or not-for-profit organizations. Participants of the focus group also included individuals involved or working with OD but only from academic, private, for-profit and not-for-profit organizations. Interviews were conducted with two types of participants. The first included specific individuals from public organizations who were responsible for publishing OD. The second were individuals utilizing OD from private, for-profit and not-for-profit organizations has showed in the following diagram. In order to determine plausible outcomes derived from OD, a scenario analysis was conducted. A scenario analysis identifies the likelihood of a specific event occurring, and in turn determines its impact on the benefits of OD. This provided a deeper examination of obvious issues and patterns related to OD – increasing the importance of social issues. The analytic tools used to analyse the data collected from the survey included the online tool available from “SurveyMonkey” and Microsoft Excel. Data was transferred from the survey to Excel spreadsheets allowing for further analysis by aggregating data results from several sources. Pervez Ghauri and Kjell Gronhaug, Research Methods in Business Studies, Fourth Edition, Pearson Education Inc. (Essex: England), 2010, 105. Ghauri, Research Methods in Business Studies, 126. Gerard J. Puccio, Marie Mance and Mary C. Murdock, Creative Leadership: Skills That Drive Change, Second Edition, (Thousand Oaks, California: Sage Publications Inc., 2011), 171. Margaret Munro, “Information watchdog to probe feds’ alleged muzzling of scientists,” Edmonton Journal, April 2, 2013, http://www2.canada.com/edmontonjournal/news/story.html?id=915b635d-e5b8-40fa-8902-dcd3a0217ffa&p=1. Ghauri, Research Methods in Business Studies, 141. Jay Ogilvy and Peter Schwartz, “Plotting Your Scenarios,” Global Business Network, 1998. 9 http://www.gbn.com/articles/pdfs/gbn_Plotting%20Scenarios%20new.pdf. The following is a brief summary of the secondary research for this paper. In the context of the research question, the review touches on elements of Information Management (IM) practices within the GC, data standards and recognized benefits of sharing Public Sector Information (PSI). In 2010, Library and Archives Canada (LAC) conducted a formative evaluation to determine government accountability regarding policy, standards and directives. Key informants were interviewed including 39 representatives from various GC departments and agencies. The results of the evaluation highlighted resourcing as a main obstacle to implementing IM practices. The Treasury Board of Canada Secretariat is leading the efforts to strengthen the management of electronic information and in 2011, the Secretariat conducted a government-wide audit of electronic recordkeeping practices in large departments and agencies. The audit found that organizations are at risk of not effectively identifying and retrieving information needed for effective decision making. This risk is caused by exponential growth of electronic information outpacing internal resources for information management. In addition, the Canadian government has been criticized for its performance in responding to access to information requests.,, Nearly half of the requests submitted to the Government of Canada exceed the thirty day limit prescribed by the Access to Information Act. Furthermore, improvements to the dissemination of OD in response to these requests could lead to more cost-effective practices. Since February 2012, Statistics Canada has been disseminating its data at no cost; information from their CANSIM database and census data is now OD. This has important social and economic benefits, especially for small organizations, research initiatives and not-for-profit organizations which could not afford the cost of accessing these datasets in the past. OD can also be used to prevent fraudulent activities. A review of questionable expense claims and receipts released as OD has helped the Canada Revenue Agency save $3.2 billion in tax receipts claims, which were disallowed. In addition, the OD data provided by Environment Canada (weather, air and water quality data) helps inform citizens and identify areas with climate issues. The US government has also embarked on similar initiatives where the release of weather data has “benefited the American people and contributed to economic growth and jobs.” Additionally, the government has created mobile and web applications which provides a directory for community clinics to help citizens gain easier access to locations near them. Meanwhile, the Danish government estimates that making basic data open and freely accessible will save the public sector $45 million per year. Likewise, the Danish private sector is estimated to save $87 million by reducing the cost of acquiring data, improving public services and adding opportunities for new digital products and services. The British Government has reduced costs through the prevention of fraudulent activities and internal operating efficiencies with dissemination of internal PSI. A recent case study demonstrates how data sharing, both within and between departments, could save $65 billion through the internal and effective use of PSI. Other benefits can be achieved when governments or private companies re-publish OD in the form of web or mobile applications. Recollect, a Vancouver company, developed and implemented a standard for managing garbage and recycling related data to remind citizens about their local collection days; this system has proven successful in several cities. Formative Evaluation of LAC Strategic Outcome 1.0, Library and Archives Canada, Last modified December 21, 2012, http://www.collectionscanada.gc.ca/evaluations-verifications/012014-380-e.html. Horizontal Internal Audit of Electronic Recordkeeping. Letter on open government for the President of the Treasury Board,” Office of the Information Commissioner of Canada, Last modified January 19, 2012, http://www.oic-ci.gc.ca/eng/rr-sl-odi-adi_2012_1.aspx. Feds ‘not the most transparent,’ says information commissioner,” CBC News, February 9, 2013, http://www.cbc.ca/. Open Government,” Office of the Information Commissioner of Canada, Last modified September 1, 2010, http://www.oic-ci.gc.ca/eng/rp-pr-ori-ari_2010_1.aspx. David Eaves, Calculating the Value of Canada’s Open Data Portal: A Mini-Case Study, Eaves.ca. Last modified March 8, 2012, http://eaves.ca/2012/03/08/calculating-the-value-of-canadas-open-data-portal-a-mini-case-study/. DCAT application profile for data portals in Europe, European Commission Joinup, Last modified March 8, 2013, https://joinup.ec.europa.eu/asset/dcat_application_profile/description. Knowledge for everyone, Open Data Institute, Last modified November 30, 2012, http://www.theodi.org/. Mehta, Diana, “Free census data a big perk but public site experiencing growing pains,” Winnipeg Free Press, April 18, 2012, http://www.winnipegfreepress.com. Kevin Donovan, “Charity rules beefed up,” Toronto Star Newspapers Ltd, December 21, 2007, http://www.thestar.com/news/investigations/2007/12/21/charity_rules_beefed_up.html. Eric Braverman, and Michael Chui, “Unleashing government’s ‘innovation mojo,” McKinsey Quarterly, 2012, http://www.mckinsey.com/insights/public_sector/unleashing_governments_innovation_mojo_an_interview_with_the_us_chief_technology_officer. Denmark’s open data initiative estimated to save government over $45 million per year and generate returns of $87 million for the private sector, Between the Poles, Last modified October 14, 2012, http://geospatial.blogs.com/geospatial/. Chris Yiu, “A Right to Data: Fulfilling the promise of open public data in the UK,” Policy Exchange, 2012, http://www.policyexchange.org.uk/digital-government. How Recollect works in 5 easy steps, Recollect, Accessed on April 20, 2013, https://recollect.net. Open Data Applications, Government of Canada, Last modified October 24, 2012, http://www.data.gc.ca/default.asp?lang=En&n=CF8AAC8B-1. Mobile App Gallery, City of Ottawa, Last modified April 24, 2013, http://ottawa.ca/en/mobile-apps-and-open-data. Amazing Mobile Apps, City of Toronto, Last modified April 24, 2013, http://www1.toronto.ca/wps/portal/contentonly?vgnextoid=7e57e03bb8d1e310VgnVCM10000071d60f89RCRD. The following is a brief summary of the literature review for this paper. In the context of the research question, the review touches on elements of effective Information Management (IM), data management and the value of data, organizational culture and the benefits of transparency from sharing Public Sector Information (PSI). The principles of IM include a series of steps for managing information through a predefined lifecycle. These steps include the planning, capturing, organizing, dissemination, preserving, disposition and evaluating of information. The Government of Canada (GC) has a well-defined IM framework which is part of a suite of policies and directives. The IM lifecycle is used to implement and improve IM initiatives and best practices within each GC department and agency. Proper management of information through its lifecycle allows for effective access to information making it available for effective decision making and re-use. The following diagram outlines the IM lifecycle. With the emergence of OD, the GC has established new operating standards for their OD portal, influenced strongly by the dissemination step of the IM lifecycle. These standards include completeness of data, primary source data, timeliness, ease of access and machine-readable formats, non-discrimination, use of common standards, available licensing agreements, freedom of use, and permanence. These principles allow government organizations to share information in ways that were not initially intended, such as dissemination to the public. To effectively share OD and create a new type of relationship with the public, GC departments and agencies need to consider these principles when managing information. With new guiding principles and outcomes for data use, the dissemination of OD requires a new cycle for information management. The Center for Technology in Government at the University at Albany in New York has taken a heuristic approach to presenting the flow of data sources related to Open Government Data. It includes an iterative process that comprises of stakeholders with specific roles and both primary and secondary sources of data. The center defines OD published on government portals as primary data sources, managed by primary data resources. Non-government data sources such as geo-coded data and third-party data are considered secondary data sources managed by secondary data resources. The combination and consolidation of these sources is where the potential for innovation and economic growth lies; this potential is currently largely untapped. Aggregating primary and secondary data sources brings in external stakeholders and in turn creates added value to data. Information and data can sometimes be used interchangeably, but there is a critical difference. Data is considered raw and factual and it has little significance beyond itself. Information is the value we extract from data, which then becomes knowledge and wisdom. For example, data can be represented digitally as tabular rows and columns, which is a structured format that can take many forms. Information on the other hand can be derived from the value that was determined by the data; this requires human input and consideration, and brings forward knowledge and wisdom. 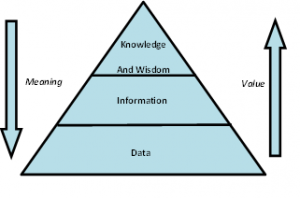 Furthermore, on the scale where data, information, knowledge and wisdom relate to each other, value is gained from the knowledge and wisdom that is initially taken from the meaning of data. This paper discusses the benefits of data and more specifically openly access data that provide information, knowledge and wisdom. The relationship between these concepts is exemplified in the following diagram. Public Sector Information (PSI) includes all of the information collected by governments and can be “otherwise known as Open Government Data.” PSI can encompass several domains of information including: business or administrative, geographic, legal, meteorological and transportation, plus social or statistical data. Due its breadth and scope, PSI has the potential for a number of economic benefits and advantages. A 2006 study measuring the European Union plus Norway (EU25) PSI market size estimated that it was worth EUR 27 billion. This equates to approximately 0.25% of their total aggregated GDP. A subsequent review of the 2006 study was conducted in 2011 on the same basis with similar outcomes. This new study for the 27 members of the European Union (EU27) demonstrated a rapid growth of approximately 7% which equated to a PSI market size of EUR 28 billion for 2008 and EUR 32 billion for 2010. PSI can be used in a wide variety of applications to innovate several goods and services. The aggregation of PSI with secondary data adds “further economic and social benefit to the EU27 economy.” In addition, this study also suggests that removing underlying barriers preventing access to data could lead to gains of 10-40% in the geospatial sector alone. Furthermore, if citizens can save two hours per year with more rapid and comprehensive access to public information it would be worth EUR 1.4 billion per year. The European Commission believes that PSI holds a significant amount of potential and that the raw material from PSI can drive innovation and economic activities if open to the public sector. The benefits of PSI are not limited to primary data. Additional savings could be attained if public organizations were to leverage secondary data creatively with PSI. In the case of the US healthcare system, effective use of external and internal data could create efficiencies of more than $300 billion each year, which the added value of combining data has the potential of reducing healthcare expenditures to the amount of 8%. Transparency, participation and collaboration are needed by governments in order to allow citizens to perform various roles. The sheer volume of data or number of datasets published by a government is not a good indicator of value. Rather, the quality and accessibility of data determines whether value has been created. Data with the most value will be centered on specific stakeholders and their interests as opposed to citizens in general. Understanding who is being served and ensuring openness of data are both critical to creating value. OD can take on many forms, but to be open it must be in a machine-readable format and available through the Internet with licensing agreements. This makes it adaptable and easier to analyze, aggregate and process, which in turn provides greater service delivery to citizens. On the other end of the spectrum, inert data includes printed reports, forms and machine-readable data that are not available through the means of the Internet. This form of data prevents ease of use. If data cannot be analyzed and aggregated dynamically with technology then most of its value is lost. To benefit from the dissemination of OD, governments need to embrace technology and minimize inert data. Ease of access and assessment of adaptable data provides transparency allows for public scrutiny and accountability. The act of releasing OD demonstrates basic government transparency, but the real benefit of accountability is only obtained with an added “degree of interaction.” This interaction requires that data reaches its intended audience and that mechanisms are in place to allow citizens to react and governments to respond accordingly. This two-directional flow is required in order to reap the full benefits of accountability as opposed to simply releasing data. This interaction can be easily achieved with today’s technology and the release of OD. The dissemination of information needs to be vetted through a series of specific criteria to protect the integrity of the organization. To mitigate this risk, many organizations have implemented a complex assessment process that is not well understood by internal staff because publishing OD is not yet a common practice. Several organizations will only release information that was requested through an access to information request, placing the onus of data transfer on external stakeholders. A government’s ability to solve problems, meet challenges and be innovative is dependent on its ability to flow information to stakeholders. Knowledge is derived from information and to be effective it needs to reach the right person at the right time. Governments will need to change internal procedures and adapt to methods of disseminating information openly. In 2008, one of the top 10 disruptive technologies was open source software; today it is OD and surrounding technologies. Public scrutiny and the demand from advocacy and special interest groups are triggering the disruptive nature surrounding OD. In addition, OD’s dependency on technology and external factors are likely to cause discontinuous or episodic changes within governments. If not managed properly these could create a culture of resistance to change. Records and Information Life Cycle Management, Library and Archives Canada. Last modified April 19, 2006, http://www.collectionscanada.gc.ca/007/002/007002-2012-e.html. 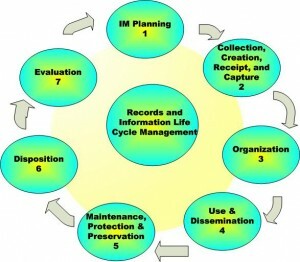 Records and Information Life Cycle Management, Library and Archives Canada. Operating Principles for data.gc.ca, Government of Canada, Last modified October 24, 2012, http://www.data.gc.ca/default.asp?lang=En&n=89BD0D43-1. Natalie C. Helbig et al. “The Dynamics of Opening Government Data,” Center for Technology in Government, (2012), 7, http://www.ctg.albany.edu/. Natalie C. Helbig et al. 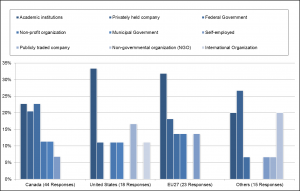 “The Dynamics of Opening Government Data,12-13. Tim Davies, “Open data, democracy and public sector reform,” A look at open government data use from data.gov.uk. (2010) 12 http://practicalparticipation.co.uk/odi/report/wp-content/uploads/2010/08/How-is-open-governmentdata-being-used-in-practice.pdf. Jennifer Rowley, “The wisdom hierarchy: representations of the DIKW hierarchy,” Journal of Information Science 33, (2007), 166, http://jis.sagepub.com.ezproxy.royalroads.ca/content/33/2/163.refs. Rowley, “The wisdom hierarchy,” 166. Naomi Lillie, “The new PSI Directive – as good as it Seems?” Open Knowledge Foundation, Last modified April 19, 2013, http://blog.okfn.org/2013/04/19/the-new-psi-directive-as-good-as-it-seems/. Graham Vickery, “Review of recent studies on PSI re-use and related market developments.” Information Economics, Paris (2011). 3. http://www.umic.pt/images/stories/publicacoes6/psi_final_version_formatted-1.pdf. Dekkers et al. 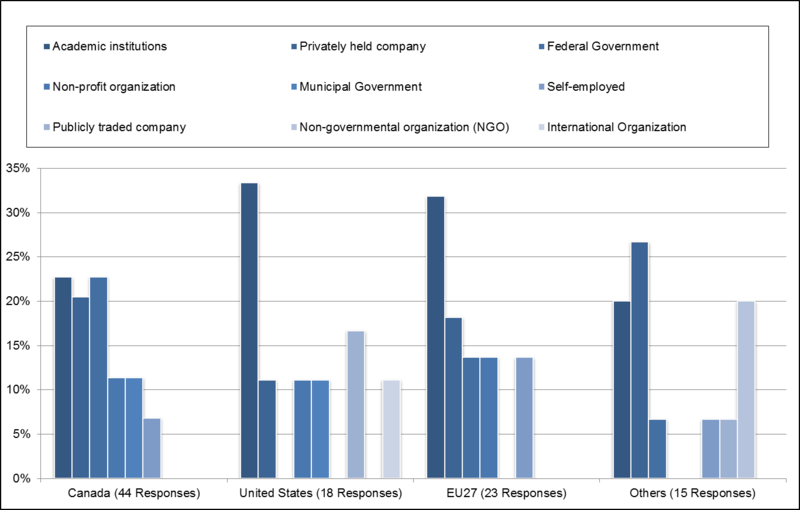 “Measuring European Public Sector Information Resources,” 16. Vickery, “Review of recent studies on PSI.” 16. James Manyika et al. “Big data: The next frontier for innovation, competition, and productivity,” McKinsey & Company (2011), 2, http://www.mckinsey.com/insights/business_technology/big_data_the_next_frontier_for_innovation. Teresa Harrison et al. “Delivering Public Value Through Open Government,” Center for Technology in Government, (2012), http://www.ctg.albany.edu/publications/issuebriefs/opengov_pubvalue. Yu, “The New Ambiguity of ‘Open Government’” 181. Peixoto, “The Uncertain Relationship between Open Data and Accountability,” 203. Warren G Bennis, et al. Transparency how Leaders Create a Culture of Candor, 1st ed. San Francisco, CA. Jossey-Bass, (2008). 4. http://voyager.royalroads.ca/vwebv/holdingsInfo?bibId=244171. David Eaves, “Rules are no substitute for cultivating a culture of open government,” Toronto Star Newspapers Ltd. April 5, 2013, http://www.thestar.com. Karl E. Weick and Robert E. Quinn, “Organizational Change and Development,” Annual Review of Psychology 50, no. 1 (02, 1999): 7. The analysis has demonstrated how OD can provide social, economic and environmental benefits to society. Several challenges surrounding the dissemination of OD are still preventing these benefits from being achieved. This section provides recommendations for obtaining further benefits with the dissemination of OD. The five recommendations outlined in this section stem from the analyses, with the objective of achieving the most benefits to society. Stronger action is needed by senior officials to prevent issues with compliancy or else availability of datasets will suffer from economic cutbacks. GC departments and agencies need to understand that they are obligated to publish datasets and OD practices need to be part of their IM practices. Legislation surrounding OD along with guidelines and tools needs to be in place to help departments and agencies manage PSI and publish OD. Recommendation #1: The GC needs to launch the Directive on Open Government to help departments and agencies publish more datasets. As part of the requirement of the directive, there must be standard tools and guidelines such as criteria for publishing that will help departments and agencies identify and publish OD. In addition, the directive should not allow departments and agencies to pick and choose the data that will be published. Instead, the directive must mandate them to publish all data that meets the criteria for publishing openly. This must also include data from access to information requests and public web sites. Similar to the Directive on Recordkeeping, the new Directive on Open Government must also contain deadlines and consequences for not meeting requirements. To mitigate the issue of compliancy, requirements of the directive must be key objectives within the performance appraisals for all Information Management Senior Officers (IMSO) and Chief Information Officers (CIO) from each department and agencies. Furthermore, a communication campaign promoting the importance of the directive should be led by the highest level of senior officials within the GC. Departments and agencies need to understand the urgency and benefits that can be obtained from publishing OD. With effective communication and a proper mandate, departments and agencies will have the ability to achieve compliance and make more data openly available. Recommendation #2: The GC should set a concrete goal to convert inert data available on their websites into a dynamic open format within the next year. This includes data that is available on public websites from all departments and agencies. If information is publicly available on government websites then it must also be available openly. Data that is only available on physical disks or in a printed format must be converted. A large amount of OD users are scraping public websites without appropriate licenses. This is an obvious indication that information published on public websites is both needed by OD users and currently unavailable in open format. With a growing number of users wanting to use OD in subsequent projects and the benefits that can be achieved from making more data available, this is a cost-effective approach for the GC to publish data that users are requesting. In addition, this would help support the academic community which are the biggest users of OD and would improve transparency with advocacy and special interest groups which lobby governments for more data to be published. There are several initiatives from other jurisdictions that could be leveraged to help implement standards, guidelines, and lessons learned from other government departments. Recommendation #3: The GC needs to identify guidelines and standards for the publishing of OD. A lack of consistency of common formats across departments was identified as an issue for combining datasets which was caused by the lack of defined standards and procedures. This lack of standards only increases costs and time delays for groups needing to aggregate datasets. Additionally, since members of the academic community are the biggest users of macro data available from the GC, the lack of standards is obstructing future innovation from research and development within Canada. The GC needs to work in collaboration with other jurisdictions to establish standards for metadata and geographic information. Furthermore, tools and procedures are required to help departments and agencies to manage OD. Existing work within other departments like Statistics Canada and Natural Resources Canada could be leveraged for the process of identifying potential standards for publishing geospatial datasets. In addition, the GC should participate in international initiatives for the development of standards and best practices. The European Commission is working on an initiative for a common standard, as is the Open Data Institute in the UK. Providing common standards will help aggregated data and gain added benefits from OD. The GC needs to provide mechanisms that will allow information to flow to all stakeholders. External stakeholders should be seen as partners in the effort to publish OD. Recommendation #4: The GC needs to collaborate with external stakeholders and all departments and agencies. TBS needs to be the catalyst for establishing a degree of interaction for the continuous flow of information. Provide the ability to change the patterns for interaction among existing and new stakeholders. This interaction requires that data reaches its intended audience and that mechanisms are in place to allow users to contribute. This two-directional flow will allow for transparency from the benefit of public accountability. The first step of the circular process could be to leverage external stakeholders to validate the need for new datasets. A series of stakeholders that are subject matter experts could be identified to provide feedback. This would give valuable insight into the value of the datasets and enhance the quality of OD published by the GC with relatively no cost. Furthermore, an advisory board needs to be created to allow stakeholders to collaborate with the publication of OD. External parties should be seen as partners in the effort to publish OD; the skills and efforts for in depth analysis that they offer could help governments reduce internal costs for identifying and publishing OD. External participation will also help create a sense of urgency for OD and remove complacency. In addition, this level of collaboration with external stakeholders would allow for the interaction needed for public accountability. Information will reach targeted audiences, provide a mechanism to react, and allow GC to respond. Recommendation #5: Changes within GC departments and agencies need to include a lean operational process for publishing OD. An interdisciplinary team within each organization will need to be identified and implemented which will use a rapid and iterative approach to publishing OD. The team will work with internal divisions to identify efficiencies and develop processes for publishing needed data in days and weeks instead of months and years. It will be important for organizations to identify key individuals with the experience and knowledge to propel lean operational changes. In addition, the team will help implement internal procedures and best practices that will meet legislative obligations for publishing OD. The Internet has changed how organizations operate and people live. One of the most important changes that online connectivity has introduced is the advent of Open Data (OD), a new technological trend that is transforming access to information. Every day, countless people are able to find new information that is open, accessible and re-useable in ways that pre-digital systems simply could not facilitate. The Open Data Institute defines OD as information that can be used by anyone for any purpose and at no cost. OD is information that is available electronically and in a machine-readable format such as Extensible Markup Language (XML), Comma-Separated Values (CSV) and dataset. In most cases, OD is made available through the Internet and is free to be used and re-used without any copyright restriction. This is made possible through the use of license agreements that allow individuals to openly use and re-use data. For effective re-use and whenever possible, OD should be time stamped, available and accessible in an open format using a non-proprietary or open source software, accompanied by useful metadata and geospatial information, which provides innovative and interactive opportunities to aggregate data with maps. As part of the efforts for driving innovation and economic opportunities, the Government of Canada (GC) launched their online Open Data Portal in March 2011 to centralize freely available data. In April 2012 the GC joined the International Open Government Partnership (OGP) and endorsed the core principles of the multilateral initiative for Open Government Data (OGD). Today the TBS is responsible for the governance, including guidelines and policies, applicable to data, and since its launch the portal has increased its federal department participation and available datasets. The GC is expanding its Open Government initiatives along three main streams: Open Information for the release of information on government activities, Open Data for making information available in a machine-readable format, and Open Dialogue which gives citizens the opportunity to dialogue with its government about policies and priorities. In addition, TB is working on the release of a new and common Open Government Licence for OD and developing a new Directive on Open Government. Today’s modern technology is providing users’ newfound flexibility to access more information than ever before. Through efforts such as those undertaken by the GC, it is evident that the proliferation of content available on the Internet is empowering citizens and is changing governments. Open Government is part of an effort to use these technologies to make government more open and accessible. Challenges surrounding the dissemination and release of OD can sometimes prevent or limit its benefits. Publishing OD may involve a number of labour- and time-intensive tasks, such as changing data formats, making sure that information is up-to-date, aligning datasets with existing licenses and meeting criteria for releasing information that could be sensitive. Despite these possible obstacles, the process of publishing data is critical for governments because it is the first step to engaging users and demonstrating transparency. In addition, it can foster internal changes to organizations, such as the implementation of new standards and technologies, and/or changes to organizational and cultural behaviors. It also begins the interactive process needed to validate and achieve a level of quality data. The success of OD is dependent on the quality of the information. In order to assure that OD is of high quality, related information must be made available. Metadata about the datasets can provide users with information about the data and allow for ease of use by improving public understanding and incorporating other information, such as geographical information. This paper will focus on examining the benefits and challenges of publishing OD for government organizations. It will attempt to identify advantages of OD published from the GC Open Data Portal. It is presumed that open and accessible data offers multiple benefits, including improved openness and accountability, as well as an increase in innovation and economic growth. This paper aims to help public organizations make sound and informed decisions for extending their OD initiatives by determining the social, economic and environmental benefits of shared data from public organizations, thereby creating a more cost-effective, transparent, efficient and responsive government. Open Data, Government of Canada, Last modified October 24, 2012, http://www.data.gc.ca/. Open Data, Government of Canada. together to form one; sometimes referred to as "combining" or "mashing up"